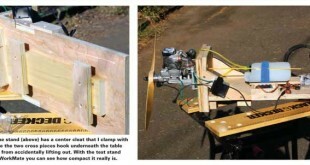 This engine test stand was featured in the December 2010 issue of Fly RC magazine. It was designed for glow and gas engines of all sizes and can be quickly made out of 3/4 plywood cut to shape on a table saw. It is designed with replaceable mounting plates that double up the firewall to ensure maximum stability and long term flexibility. Here is the K100 flying at 392mph. FUTABA S.BUS SYSTEM Videos courtesy of Hobbico posted on YouTube.com SOFTWARE DOWNLOADS: Click here to download the PCLink Software. Click here to download the SBD-1 Software. Click here to download the SBD-1 Instructions.